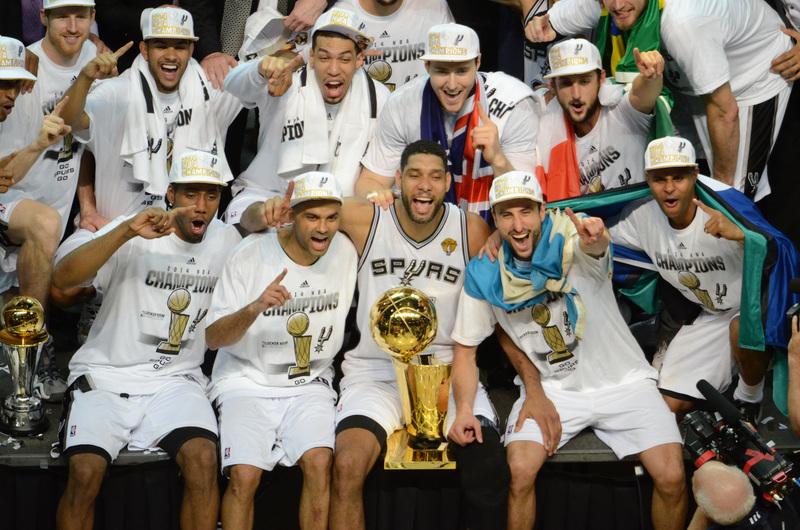 The San Antonio Spurs exercised some demons as they defeated the Miami Heat to win their fifth NBA title in 16 years. With all of their championship stars set to return next season, the Spurs will look to repeat for the first time in franchise history. Entering this season, the San Antonio Spurs were coming off of one of the most gut-wrenching Finals losses in NBA history, falling agonisingly short against the Miami Heat. However, despite the demons of last year’s Finals loss, their advanced age and again facing the Heat’s star-studded lineup in the Finals, the Spurs bounced back in emphatic fashion. San Antonio cruised to their 15th-consecutive season with at least 50 wins, finishing with a league-best 62-20 record, rattling off three winning streaks of at least six games, including an 11-game streak in early January and a franchise record 19 straight through late February and early April. Perhaps even more impressive, the Spurs only lost consecutive games twice during the season, falling to the Miami Heat, Houston Rockets and Chicago Bulls in late January and closing the season with losses to the Rockets and Los Angeles Lakers. Remarkably, San Antonio’s success came despite the strict minutes restriction they enforced across their roster, with no player on their squad averaging 30 or more minutes per game. After a seven-game struggle against a valiant Dallas Mavericks squad, the Spurs made relatively easy work of the rest of their postseason opponents – they beat out the Portland Trail Blazers 4-1 in round two, their Western Conference Finals series against the Oklahoma City Thunder finished 4-2 and they breezed past the Heat 4-1 to claim their fifth championship in since 1999. The Spurs set a new NBA records, outscoring their playoff opponents by 214 points, winning each Finals game by an average of 14.5 points and shooting 52.8% as a team in the Finals. Simply put, the San Antonio Spurs were by far the best basketball team on the planet last season. They finished the season sixth in points per game (105.4), seventh in offensive efficiency (110.5), sixth in points allowed (97.6), third in defensive efficiency (102.4) and first in point differential (+7.8). Meanwhile, alongside their Big Three, the Spurs bench decimated opponents’ second units, scoring 44.6 points (first in the league) at 47.8% from the floor (first) and 39.3% from beyond the arc (second), grabbing 16.8 rebounds (second) and dishing 11.0 assists (first per game), while recording the best offensive (51.3) and defensive efficiency (16.5) in the Association. Patty Mills emerged as one of the best instant offence players in the league, averaging 10.2 points per game, while knocking down 42.5% of his three-point attempts – both career-highs and the latter seventh-best in the NBA. Meanwhile, Marco Belinelli (11.4 points and a career-high and fifth-best in the L 43.0% 3FG) was another consistent long-range threat and Danny Green (9.1 points and 41.5% 3FG – 11th in the Association) was the perfect ‘Three and D’ player. Boris Diaw’s versatility as a scorer, passer, rebounder and defender was invaluable down the stretch, despite his modest averages of 9.1 points at 52.1% from the floor (20th in the league), 4.1 rebounds and 2.8 assists per game. Likewise, Tiago Splitter’s 8.2 points and 6.2 rebounds won’t jump off the page at you, but he was a crucial cog in San Antonio’s overwhelming offence and destructive defence throughout the year. Meanwhile, Jeff Ayres (13.0 minutes, 73 games, 10 starts), Cory Joseph (13.8 minutes, 68 games, 19 starts), Matt Bonner (11.3 minutes, 61 games) and Aron Baynes (9.3 minutes, 53 games, nine starts) were always ready when called upon. To select an individual MVP would be a disservice to the culture of playing as a team that the Spurs showcased throughout the year. However, the play of their four stars was obviously a driving force to their success. In his 17th season, and at 37-turning-38 years of age, Tim Duncan was still a beast, dropping 20/20 games and winning Player of the Week awards like he was still in his rookie season. Despite playing the third-fewest minutes per game of his career (29.2), Old Man Duncan still put up 15.1 points (at 49.0% from the floor), 9.7 rebounds (12th in the NBA), 3.0 assists and 1.9 blocks (fifth) per game this season. Meanwhile, all of the rest during the regular season proved worth it as Duncan increased his minutes load to 32.7 per night and averaged 16.3 points at 52.3% and 9.2 boards per night on his way to a fifth ring in 16 years. Likewise, Tony Parker was limited to the equal-fewest minutes per game of his career (29.4 – the same workload he logged as a 19-year-old rookie 13 years ago), but was still a key cog to the Spurs success. Despite his limited role, Parker still led San Antonio in scoring and assists, averaging 16.7 points and 5.7 assists (20th in the L) per night, making his sixth All-Star Game and being voted to the All-NBA Second Team in the process. And again like Duncan, the Spurs 31-year-old speedster increased his workload and production when it mattered in the playoffs, averaging 17.4 points and 4.7 assists through 31.3 minutes a night. At the risk of sounding like a broken record, Manu Ginobili also played limited minutes, averaging 22.8 per game – the fewest since his rookie season. After suffering through one of the worst playoff series in his career in last year’s Finals, Manu was back to his instant-offence self, averaging 12.3 points and 4.3 assists for the season and finishing third in Sixth Man of the Year voting. Perhaps more satisfying for the 36-year-old Argentinian, Ginobili avenged his poor Finals performance to the tune of 14.4 points at 50.0% and 4.4 assists in the rematch against the Heat. All in all, the Spurs Big Three became the winningest trio in NBA postseason history, improving their tally to 118 playoff wins, besting the previous mark of 110 set by Magic Johnson, Kareem Abdul-Jabbar and Michael Cooper. Finally, Kawhi Leonard performed incredibly in the Finals, bouncing back from two subpar games at the beginning of the series to win Finals MVP. The 22-year-old finished the regular season averaging 12.8 points at 52.2% (18th in the league), 6.8 rebounds and 1.7 steals (10th) in just 29.1 minutes per game and was voted to the All-Defensive Second Team. However, he saved his best performance for the Finals, averaging 17.8 points at a super-efficient 61.2% from the field and 57.9% from deep, 6.4 rebounds and 1.6, while also going toe-to-toe with LeBron James each night against the Heat. 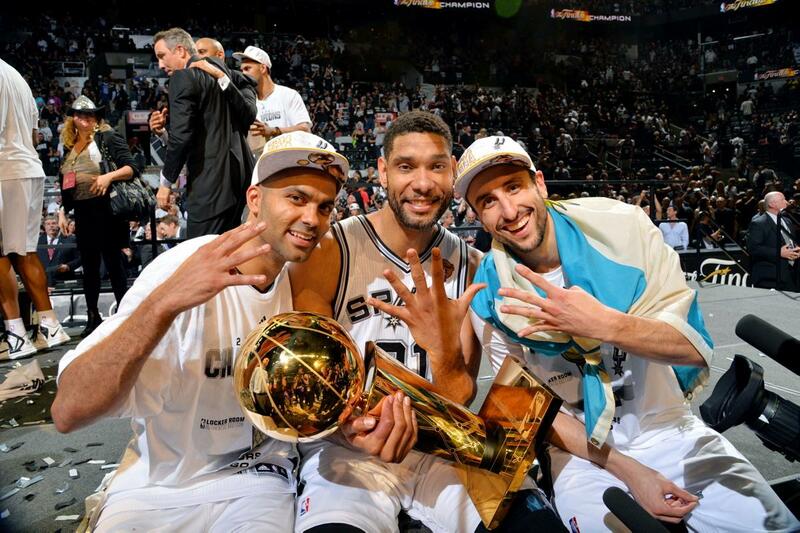 The Spurs are not a team built for MVPs, but they’ll settle for being a team built for championships. The genius behind the Spurs incredibly system, Gregg Popovich was easily the biggest ace up San Antonio’s sleeve. From keeping his stars fresh with limited minutes, experimenting with countless lineups to prepare for any situation, turning role players into game-breakers and developing one of the deadliest and most aesthetically pleasing styles of basketball the league has ever seen, Popovich gave his team the perfect game plan to avenge their crushing Finals defeat. 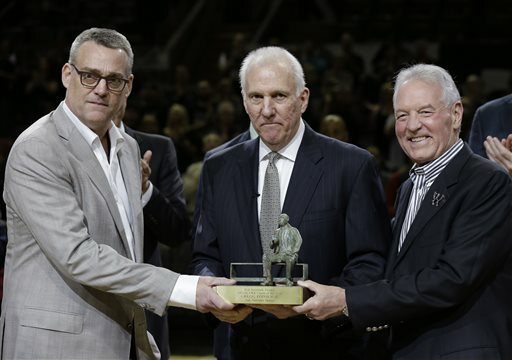 All the Spurs players had to do was follow Pop’s instructions and reap the rewards. After leading his team to yet another 50-plus-win season, Popovich was voted the league’s Coach of the Year, much to his displeasure. However, just like players on his team, Popovich is part of the culture he helped create and individual awards pale in comparison to the team success they achieved at the end of the year. Maybe Duncan, Parker and Ginobili could have won a few titles without Pop, but his presence on the sidelines took that maybe and turned it into a certainty. The offseason plan for the Spurs should be simple; retool and repeat. 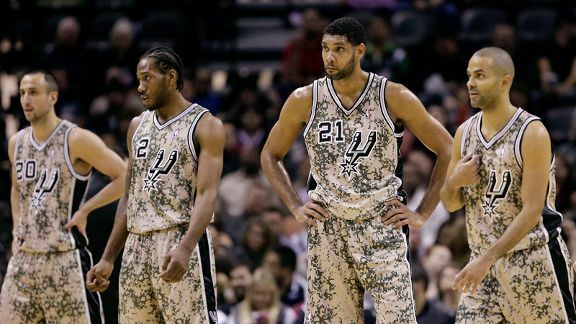 The Spurs might be one of the juggernauts in the modern NBA era, but they have never defended a title before. So, there will be no shortage of motivation for Popovich’s men heading forward. Last offseason, still stinging from the pain of a Finals defeat, San Antonio lost gunner Gary Neal in free agency. However, such is life with the Spurs, they simply restructured their roster, adding Belinelli and handing minutes to Mills and did not miss a beat. San Antonio also had a typically Spurs-like draft, falling over themselves to select UCLA utility, Kyle Anderson, with the final pick of the first round. Anderson is the perfect Spurs player. He might possess elite athleticism or blow people away with highlight plays, but Anderson does lots of valuable basketball things well. Anderson averaged 14.6 points, 8.8 rebounds, 6.5 assists, 1.8 steals and 0.8 blocks per game, while playing from point guard to small forward in his sophomore season with the Bruins – he also connected on 48.0% of his attempts from the field and 48.3% from three. Boris Diaw was a vital cog in the Spurs championship run and now they have two of him. The Spurs also selected Serbian forward, Nemanja Dangubic with the 54th pick. He might never play in the league, but judging by their track record, Dangubic could also be the best player in the draft. Such is the success of the San Antonio’s scouting. Duncan has opted-in for another year, Parker, Ginobili, Leonard and Splitter are all still under contract and even if they see a few free agents walk away, the Spurs will have up to $10 million to replace those pieces. Most pressingly, Diaw and Mills are out of contract. Diaw is likely to re-sign, and Mills has shown a desire to stay with the team that gave him his first real opportunity in the league, but a big-money offer could pry the young Australian away from the Lone Star State. Bonner and Baynes are also entering free agency, but they wont be hard to replace in the open market if they are not brought back. Coming off of a championship, there is no need for the Spurs to make any drastic changes to their roster. Although, one has to wonder how an Avery Bradley, Shawn Marion or Shaun Livingston would excel under Popovich. The reigning champs are rarely short of potential free agent suitors, and Popovich and Co. seem to always be able to turn any misfit into a crucial role player. Don’t expect major changes in San Antonio, but expect anyone they do bring in to become a crucial piece to their title defence.